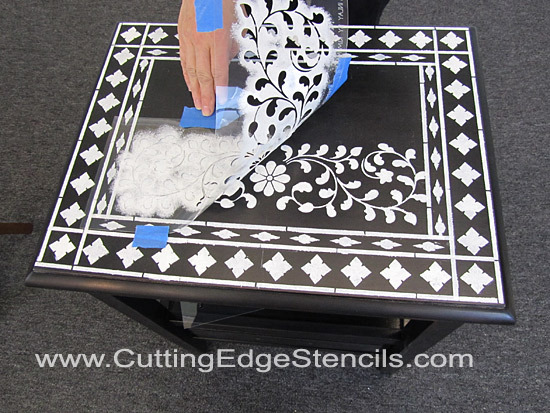 Home Painting Tips and Tricks from Pros Stencil some furniture with Indian Inlay Stencil Kit! Indian bone inlayed furniture is so popular now! It has been popping up all over the design world, and for good reason: the exquisite craftsmanship and refined intricate designs bring such a luxurious feel to your decor. Reflecting the current trends of Ethnic diversity and World heritage, these furniture pieces create a stunning accent in any room. Usually bone inlay is done on a black background, like these fabulous chests and tables from the Wisteria catalog. Inlay also looks very sophisticated over a beige background (check out this inlayed accent table), and recently we’ve seen some truly breathtaking inlayed furniture pieces by Horchow that are done in the most beautiful blues and trendy pinks. Understandably, these hand-made pieces command high prices. So what’s a DIY gal to do? Stencil a piece of furniture in Indian Inlay of course! And save like, a thousand or two, while having fun stenciling. So where do we start with this furniture stenciling adventure? You can pick up a piece of furniture from a garage sale and paint it in your background color or purchase an inexpensive piece from a store that already has the right background. That’s what we did, out of sheer laziness: we found this inexpensive piece at Pier One and used it for our inlay stenciling project. It was just a plain black side table, nothing special. It was begging to be stenciled! Then we gathered up some tools. We used our Kim Myles “Indian Inlay Stencil Kit“, a stencil brush, a ruler, a chalk pencil (you can use a chalk or pencil but we had a fancy Chalk Pencil that muralists use for sketching out murals), Benjamin Moore Bone White Aura paint, a paint can opener, low-tack blue tape, paper towels, a foam plate and a fine Scotch-Brite pad. We started by lightly scuffing the surfaces of the table with the Scotch-Brite pad. It’s a necessary step needed to break a glossy sheen so our paint sticks better to the surface when we stencil. Make sure to rub all the surfaces that will later get stenciled. Don’t worry if the surface gets a little hazy: it will later disappear as we wipe the table with a moist rag before laying out the stencils. You can also use a fine 400 grit sandpaper, but it may still scratch the surface too much. We find that a fine Scotch-Brite pad does the job just fune. OK, make sure to wipe all the surfaces with a damp rag to clean off any dust. Now it’s time to get creative and layout your design! 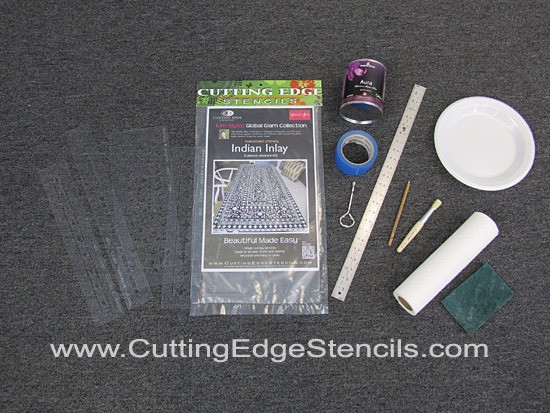 The Indian Inlay stencil kit comes with 5 versatile elements, and you can lay them out in any way you like to fit your specific piece of furniture. For this particular piece we felt like a large leafy insert would look great in the center, and then we’ll frame it with a border inlay stencil. Here we’re using a chalk pencil, but as I said, a small piece of chalk or a regular pencil will work to. Make a few marks so you can see where the designs are going. Your layout doesn’t have to be perfect. We discovered that a little extra space here and there will not be noticeable once you stencil the piece. You can also fill in some empty areas using a small element (like a flower) from one of the stencils. 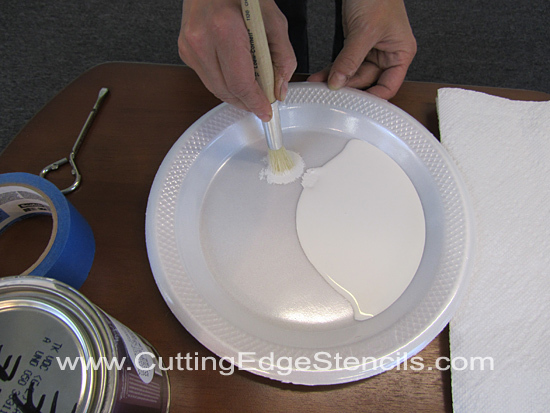 Pour some Benjamin Moore Bone White paint onto styrofoam plate. Dip your stencil brush into the paint, work it into the bristles by doing a couple circles on the plate and don’t forget to blot off extra paint on a folded paper towel! Now we’re going to stencil. Fun, Fun! We decided to start with the outside border. I guess you can start wherever you feel like but we decided to stencil from outside in. We taped the stencil down with a few pieces of blue tape. No stencil adhesive at all! Simply pounc with a stencil brush, using up-and-down motion. Benjamin Moore Aura paint is so opaque and we got perfect coverage in one pass! Remove the stencil and continue around the table. We didn’t wait very long because the paint dries pretty quickly. Just be careful not to smudge it while moving the stencil because it’s still fresh paint. If you’re concerned about smudging, wait for a minute before re-positioning the stencil or use a hair drying to really dry the paint. Look how crisp it’s turning out! Now just rotate this leafy stencil to do the other half… No need to clean the stencil in between! The top is almost stenciled! Doesn’t it look great? Now we are going to do this “Pea and Sausage” border on the curved part of the table. The stencil plastic bends nicely so it was easy to do! Notice how I taped it from underneath? It’s a little trick from the pros for ya. 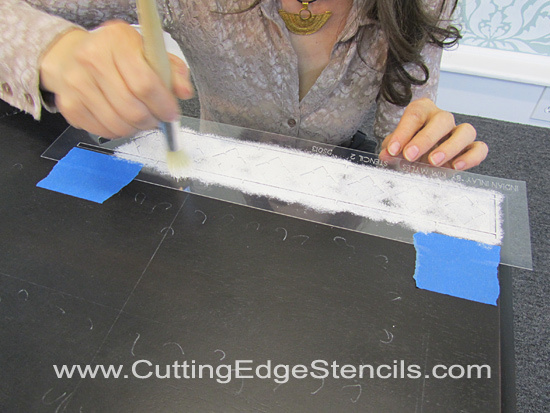 When you get to a tight place where there is not enough room to tape from the top – just tape the stencil from underneath! It will work great and hold the stencil in place. Make sure to use a few pieces of tape. 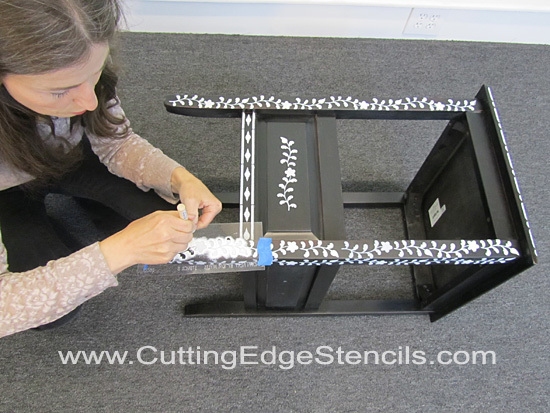 This trick works great when stenciling drawers, furniture legs and other smaller parts where there is not enough room for taping. 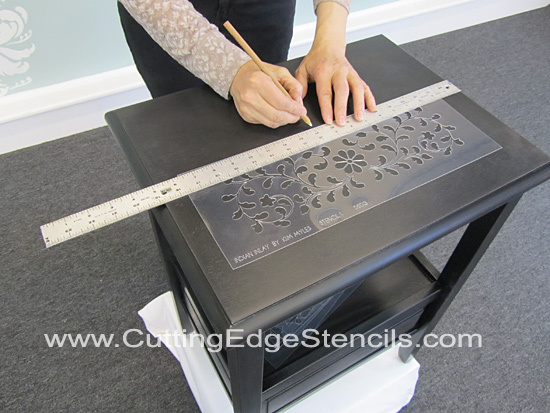 For the table legs, use the small leafy stencil included in the Inlay Kit. We’re almost done! 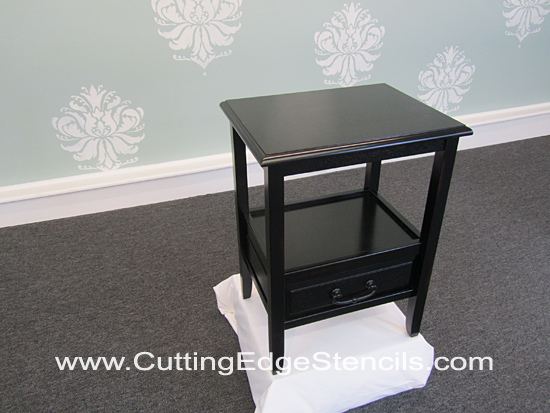 When we finished stenciling we decided to protect our stenciled ornaments by giving the table a quick topcoat. We just used a spray topcoat called Krylon Matte Finish – it’s great for this! But there are other clear top coats. Some you can apply with a brush and some you can spray. You can bypass the topcoat, but we recommend it for extra durability. And now……Ta-Da!!! The big reveal! Isn’t it gorgeous? We LOVE it! Looks like the “real thing”, minus the price tag and it took less than 2 hours to complete the stenciling, seriously! No one could believe this piece was stenciled! And while we’re at it, why not stencil a small picture frame or two? 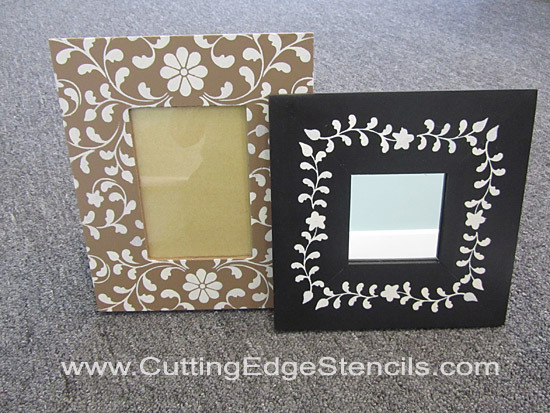 We had the paint already open… These frames were so boring before, now they really look great stenciled. 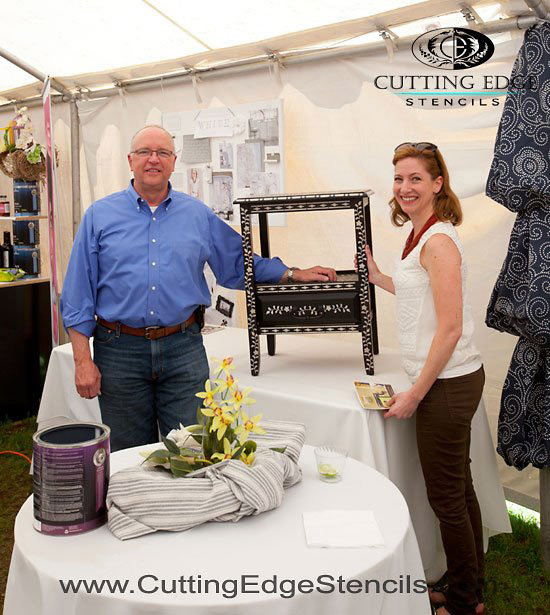 This beautiful stenciled inlay table was later donated by Cutting Edge Stencils to be raffled off at the Brimfield Antique Show. We were guest exhibitors at the Tweet-Up VIP tent with Benjamin Moore Paint. You can read all about it on our Facebook page. Now, doesn’t this make you inspired and wanting to stencil a piece of furniture or two? 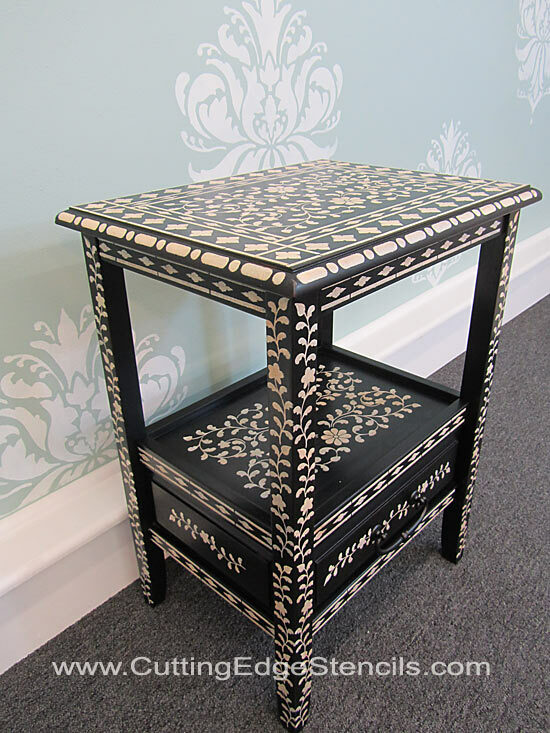 So go ahead, grab one of our Indian Inlay Furniture Stenciling Kits and go on the hunt for the perfect piece of furniture, mirror, picture frame, or tray! 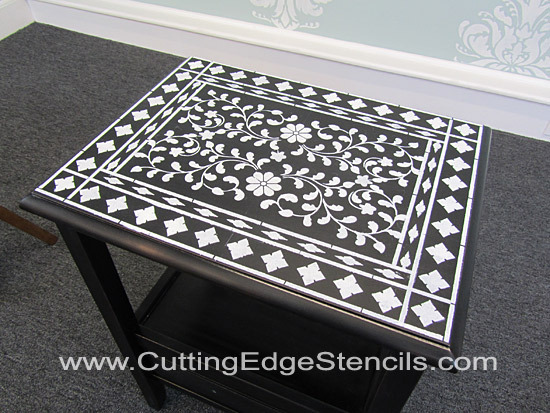 Have fun stenciling and please post some pics on our Facebook Fan page. 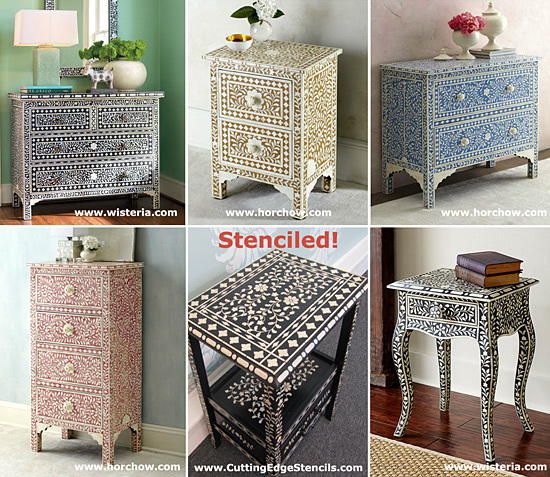 If you love the idea of stenciling furniture but had a different design in mind, check out our craft stencils for more furniture up-do inspiration. To get even more juicy details, please watch this short video tutorial that Greg just made!